Can’t remember which clementines you bought last week and which ones were fresh this week? A Fruit Skelter takes the guesswork out of your fruit’s age. By topping up your Fruit Skelter from the back and taking it from the front, you’ll always eat your fruit in date order. Happy days! How do you store your bananas? Keep them in a bowl and they’ll bruise, keep them in contact with other fruit and they’ll over-ripen. A Fruit Skelter offers the solution. Attach the removable hook to hang your bunch and not only will you save space but your bananas will ripen evenly. Do your pesky pears squash your soft satsumas? Layering all your different fruits in one basket is always going to cause chaos. 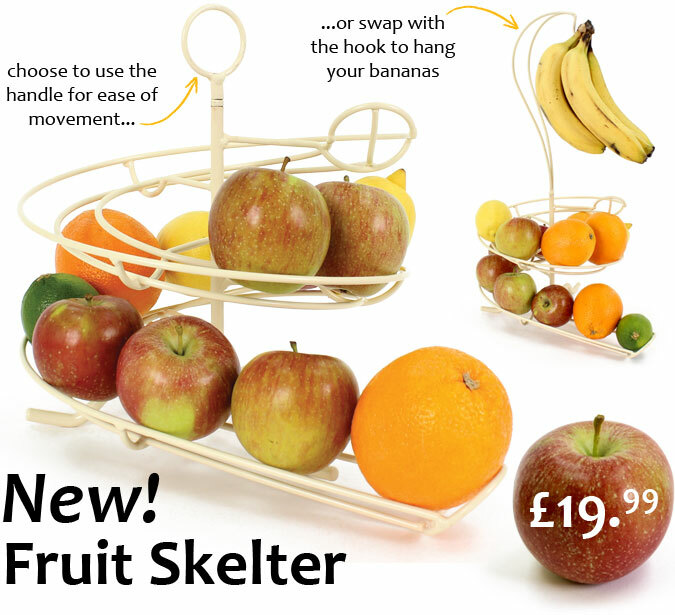 A Fruit Skelter prevents these disasters by making your fruit queue up in an orderly fashion and behave sensibly. Those Braeburn bullies won’t push their weight around anymore. The Fruit Skelter looks magnificent in any home, creating a mouth-watering visual spectacle. Keep it topped up and the spiralling edible rainbow may even encourage you to eat more fruit, helping towards a healthy and happy lifestyle. This offer is valid in the UK only, from 19th to 31st January 2015.